Spread flour in shallow baking dish. Season with salt and pepper. Beat eggs with 1 tablespoon water in second shallow baking dish. Mix bread crumbs, panko, and cheese in third shallow baking dish. Prepare chicken breast: Set between two sheets of heavy plastic wrap that have been lightly spritzed with water and gently pound to an even thickness, about 1/4- to 3/8-inch, with a meat mallet or rolling pin. Season cutlets on both sides with salt and pepper, pressing seasonings into meat with your fingers. Dredge cutlets in flour, coating both sides and shaking off the excess. Then dip both sides of cutlets in egg mixture, letting excess drip back into baking dish to ensure very thin coating. 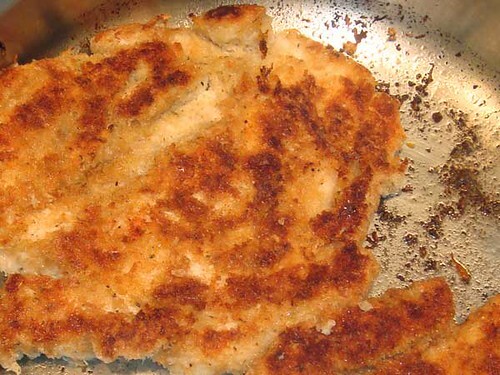 Dip both sides of cutlet in bread crumbs, pressing crumbs with fingers to form an even, cohesive coating. Preheat large saute pan over high heat, add 1 tablespoons of butter and 3 tablespoon of oil to pan. Heat until butter is melted and sizzling. 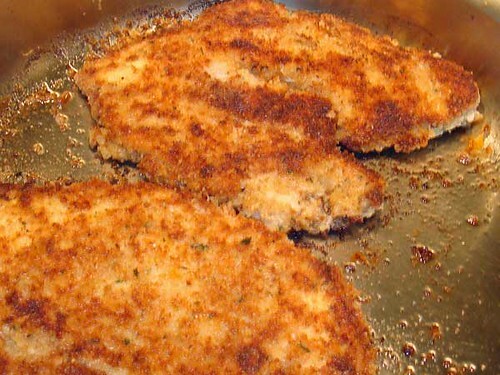 Place 2 cutlets in each pan and cook until golden brown and crisp, about 2-1/2 minutes. Flip over and continue cooking until golden brown and chicken is cooked through, 2-1/2 to 3 minutes longer. Drain on rack set over a baking sheet, then transfer to a warm serving platter. Serve with lemon wedges and garnish with parsley sprigs.